I was diagnosed with breast cancer when I was 41. My mother and grandmother both died of breast cancer, so I had kind of expected I might get it even though I do not have a BRCA mutation. Fortunately, my mom’s nurses had urged me to start early with mammograms which is how mine was caught. I am an editor at the State Department, working on social media content for foreign audiences. I previously worked as a Reuters correspondent for about 24 years with postings on four continents covering everything from the White House to wars to the Olympics. My undergraduate degree is in Foreign Service from Georgetown University and I did my graduate work in Latin American politics at two Argentine universities. I am a member of the National Breast Cancer Coalition (NBCC) and am a mentor with Survivors Offering Support at Georgetown, which pairs mentors with newly diagnosed breast cancer patients. I researched a lot after my mom was diagnosed with cancer and again after I was diagnosed. I wanted to use that knowledge to help find a way to end this disease. 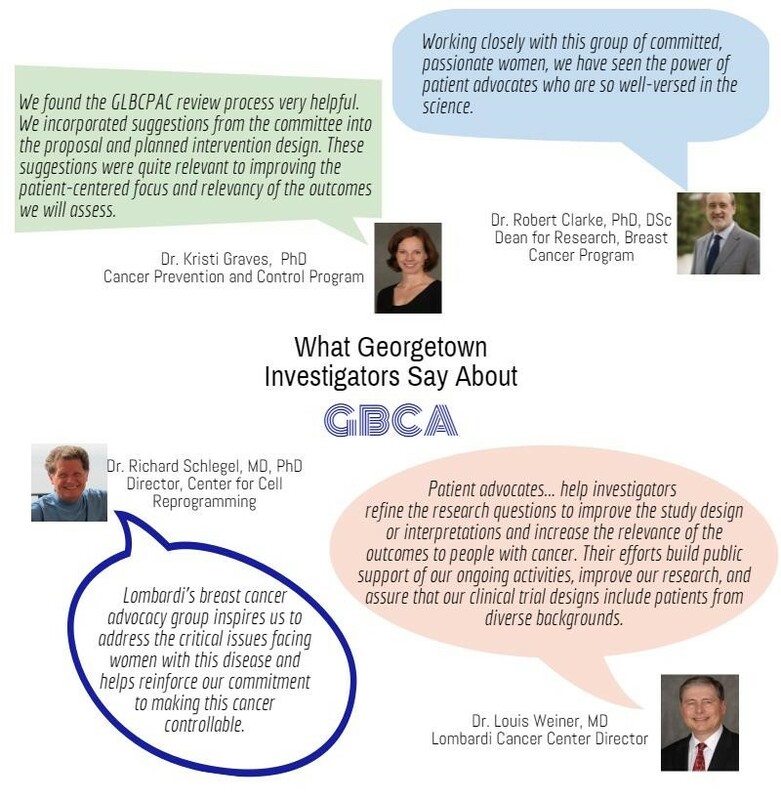 I was first involved as a mentor for new patients, but then joined Georgetown Breast Cancer Advocates when it was created in 2011. Through advocacy I see a way to help get more funds for vital research and to make sure the patient’s voice is considered in research. I am a graduate of NBCC’s Project LEAD program and have been a consumer reviewer four times with the Department of Defense’s Congressionally Directed Medical Research Program for the Breast Cancer Research Program. I am especially interested in helping with grant reviews. 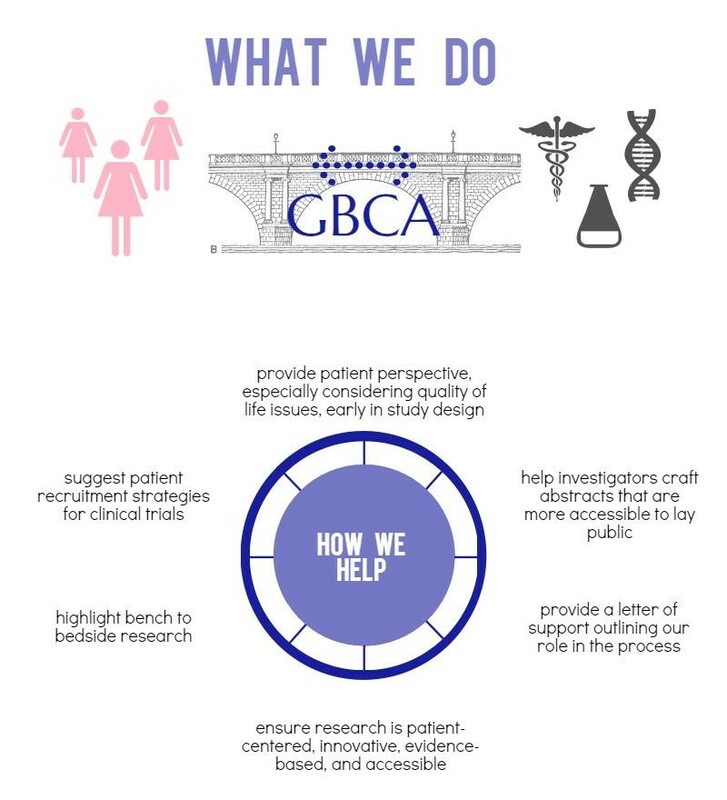 I also received an Alamo Foundation grant to attend the San Antonio Breast Cancer Symposium in 2015, which gave me the opportunity to help present a poster on GBCA and to learn a great deal from the presentations.